These little one-bite wonders are the perfect example of a quick, easy-to-make, and flavorful finger food. And they are super addictive: once you pop, you can't stop! 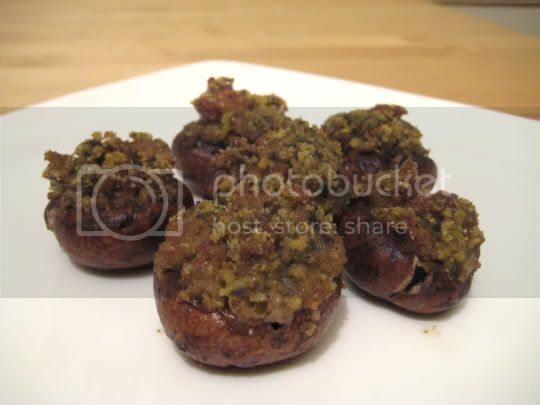 Earthy, meaty mushrooms are stuffed with a mixture of soy sausage, pesto, and breadcrumbs. The sausage flavor with the mushrooms is amazing, and adds to the "meaty" taste and texture. The parmesan in the pesto (use a good one) really stands out and provides a nice salty flavor, and the olive oil in the pesto makes these mushrooms tender and juicy. I used plain breadcrumbs (which blend well with the pesto for texture), but a seasoned variety would probably add even more zip. One suggestion I would make about changing the cooking method: roast, don't "steam," the mushrooms once they are stuffed. The recipe instructs you to bake the mushrooms in a water-filled, foil-covered pan, but this made them extremely slippery and I think a lot of the juices were lost this way. The next day, I baked the leftovers on a baking sheet for about 15 minutes, and they were slightly cripsy and browned on top, and the mushrooms were firm and, frankly, more appetizing. Make again? Definitely. It's recipes like these that make me start to actually enjoy the once-hated mushroom.